The Onion will stop publishing print editions, like this one, in Milwaukee and two other markets next month. It's a sad day for the sarcastic among us. The parody paper The Onion will publish its final print edition for Milwaukee newsstands on December 12th, according to an article published today on its local entertainment site The A.V. Club Milwaukee. The Onion will also stop publishing print editions for its other remaining markets, Chicago and Providence, R.I. The Onion once printed in 17 markets, according to the Business Journal of Milwaukee. 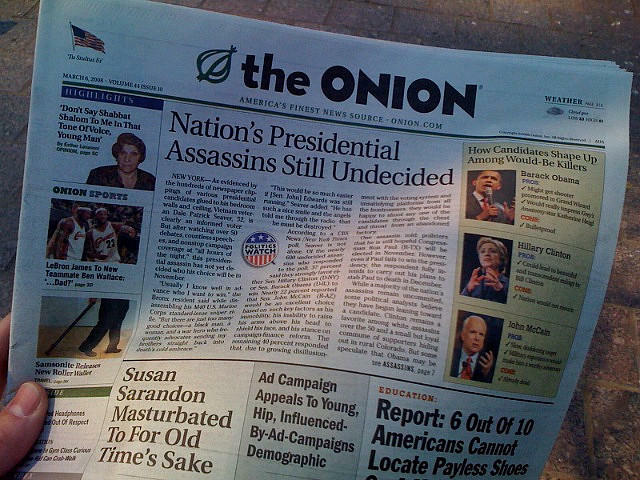 The Onion will continue online, as will its non-satirical arts and culture paper The A.V. Club. But for Milwaukee readers, the news gets worse. As the only remaining local A.V. Club site, The A.V. Club Milwaukee will soon stop producing daily stories and close its website next month. City Editor for A.V. Club Milwaukee Matt Wild says in the article that the decision was not based on content or revenue, but had "everything to do with this crazy thing called the Internet." "In an increasingly digital and consolidated world, having just one city publishing a paper and posting local content simply doesn’t make sense," he writes. Self-described as "America's Finest News Source," The Onion was started in 1988 by two University of Wisconsin-Madison students. After being sold and expanding its print edition to a few cities, it got national attention - and readership - after its website launched in 1996, according to the Washington Post. In typical Onion style, editor Wild humorously bid adieu to Milwaukee readers. "I know I’ve used the phrase 'Great job, Milwaukee!' sarcastically in the past, but it’s always come from a place of deep love and awe for a city I’ve called home for nearly 20 years," he says. "The Milwaukee of 20 years ago and the Milwaukee of today couldn’t be more different, and that’s thanks to the many amazing people and institutions that bleed this city each and every day. That includes you." The Onion just celebrated its 25th anniversary this year, and its founders spoke with Morning Edition host Renee Montagne in August.